Wow was that ever useless. It took a while but I got to the bottom of it. The official Ruby docker image is built on Debian Jesse and ships with MySQL 5.5, but I’m using MySQL 5.7 (yay for JSON support!). The mysql2 gem is a native extension which links against libmysql. Turns out MySQL 5.5 client doesn’t play nice with MySQL 5.7 server. And hooray it works! If Googling this baffling error message brought you here, don’t forget to like, comment and subscribe. Amazon Lambda is a “serverless compute” service from AWS that lets you run Nodejs, Python, or other code. They have extensive documentation, but I found a disconnect: I was struggling to get the API gateway to map into Lambda functions. I put together a YouTube video, but some of the highlights are below. The source code for the project is on GitHub. For the others, just accept the defaults. The IAM Role can be tweaked to allow your lambda function to access S3 as well. Your method needs to have a event and context objects. The event object is how properties are fed into your function from the API Gateway, and the context object is how execution is stopped and response values passed out. If you got this far, the lambda function works. I deliberately kept this document thin. Check out the YouTube video to see it all come together. This is the story of how we upgraded Chef server 11 to Chef server 12, open source, on CentOS 6. Step 0: Work off a snapshot of your server. I can’t stress this enough. You’re going to have issues. Use a snapshot. Because the old recipes that need fixing aren’t discovered until you attempt the process, I’ll lay out our challenges and solutions at the end. After this, just follow their instructions. It went smooth without issues, so I won’t re-hash it. Chef 12 added a new feature allowing multiple organizations in a single server. The upgrade will prompt you to create an organization, and all your cookbooks, users, nodes, etc will be re-created in it. We only have one organization, and it looks like knife and chef-client just “do the right thing”. Cookbooks are checked and updated as necessary. Undocumented and hard to troubleshoot exceptions are thrown. All objects are restored using knife restore. More exceptions probably. The upgrade is complete, but your server cert is not copied over so all your nodes start alarming. Troubleshooting the exceptions, which was the bulk of our challenges, is covered in a section below. For the server certificate, copy /var/opt/chef-server/nginx/ca/ to /var/opt/opscode/nginx/ca/. grep -rL "name" * --include="metadata.rb"
Of course, that doesn’t help you if you were using metadata.json. We weren’t much. If you are … good luck. During the migration, the cookbooks are parked in ‘/tmp/somethingrandom/cookbooks’ and since ‘/tmp/somethingrandom/lib/chef/sugar/version’ doesn’t exist, the process blows up. Of course, it doesn’t actually tell you that. To be extra helpful, it deletes ‘/tmp/somethingrandom’ before throwing the stack trace, leaving you utterly unable to diagnose. Worked this out using pry. There is a whole subsection on that below. You run this sort of magic command ‘chef-server-ctl upgrade’ and it just does “things” for you. If you encounter an error, and you want more details, you’re kind of out of luck. There is no way to pass -VV through into knife, which it’s calling behind the scenes. This let me actually see what chef-server-ctl upgrade was running so I could step into a specific place. You’ll get some examples of how this helped below. It won’t create those directories for you, make sure you do it first. Now you get to do useful things like dump ‘@inferred_cookbook_name` and cookbook_version (if your metdata specified one) so that you can figure out whats going on, or at least where it’s going on. I’m writing this a few days after completing the project. There may be other gotchas, but the thing is working now and we’re back to pushing roles, nodes and cookbooks. I needed to overcome the Nagios limitation of a slow polling interval for CPU utilization. Splunk provides robust tools for leveraging WMI to monitor windows performance. So you think to yourself: “Great, lets look at CPU usage per process on important servers”, and you bump right up into the catch. Windows perf counters come in two flavors: “raw” and “formatted”, and Splunk only reads the formatted ones. This is fine for most things, but for CPU usage, the data isn’t accurate on multi-core systems. This post covers how to use the raw data, and “cook” the values to match what you’re used to seeing in task manager. CPU utilization is measured by % Processor Time over a set period. A mutli-threaded application makes calculating utilization on multi-core systems not as simple 0 to 100 scale. During a time slice, several different threads may have had processor time on a core, or more likely, different threads will have had different utilization on different cores. When calculating CPU usage on a Windows system, the maximum is actually 100% x # of cores. The formatted CPU usage per process counter doesn’t take this into effect, and the results will not be consistent with what you see in performance monitor or task manager. I’ll get into applying that formula in Splunk in a minute, but first, getting the data in. The file must go in wmi.conf, it’ll appear in the GUI as a remote performance monitor. Streamstats pulls values from the previous record forward. We don’t need the current value, so we drop it. Throw out anomalous values. * 400 is 100 x the number of cores on this box. Adjust yours accordingly. * PercentProcessorTime increments forever, if you plot it on a chart it rises over time. When running the math on a single process, it’s fine, the next value is always higher than the last. There are issues around the transitions though. If the last value of PercentProcessorTime for ProcessA is 40000, and the first value for ProcessB is 10000, then the delta is 30000 and it throws the graphs way out of whack. The easiest thing to do is just drop those values. We’re going to pipe the values through an avg() in timechart anyway, so little gaps like that will get smoothed out. I used a little app called CpuKiller to throttle the CPUs and make the results more obvious. The same data plotted in Splunk. Note that Splunkd doesn’t appear in the perfmon graph because I didn’t include that process, but the WQL being run by Splunk watches all processes. Some of the fun things you can do with this are look at processes from a number of servers across an entire farm (for example, your web servers), or plot application response times against resource utilization. Yay for Splunk! CoreOS bills itself as “Linux for Massive Server Deployments”, but it turns out, it’s excellent for smaller deployments as well. CoreOS was intended to run in big cloud providers (Azure, AWS, Digital Ocean, etc) backed by OpenStack. I’ve been running CoreOS for a while now, on premises in VMWare. It is kind of a pain: clone the template; interrupt the boot to enable autologin, set a password for “core”; reboot again; re-mount the disk rw; paste in a hand crafted cloud-config.yml. Fortunately for me (and you! ), VMWare has an API to inject settings into guests, and CoreOS has added support for using those settings in coreos-cloudinit. Information about the supported properties is here. It’s all automated though, so mostly I get other productive work or coffee drinking done while it’s conjured into existence. interface.0.name ens192 The name of the interface to assign id #0 for future settings. The kernel names the first nic ens192 in VMWare. interface.0.role private This is my internal (and only) NIC. interface.0.dhcp no Turn off DHCP. I like it on, most like it off. The script will pick up a cloud-config.yml and base64 encode it for you and inject it. Check out the source in github to learn more. If you’re looking at the CoreOS documentation on the VMWare backdoor, you need to put “guestinfo.” infront of all the properties. For example, guestinfo.dns.server.0. The VMWare RPC API only passes properties that start with guestinfo. The team at TNWDevLabs started a new effort to develop an internal SaaS product. It’s a greenfield project, and since everything is new, it let us pick up some new technology and workflows, including neo4j and nodejs. In my role as DevOps Engineer, the big change was running all the application components in Docker containers hosted on CoreOS. CoreOS is a minimalist version of Linux, basically life support for Docker containers. It is generally not recommended to install applications on the host, which raises a question: “How am I going to get my application logs into Splunk?”. With a more traditional Linux system, you would just install a Splunk forwarder on the host, and pick up files from the file system. With CoreOS, you can’t really install applications on the host, so there is the possibility of putting a forwarder in every container. This would work, but it seems wasteful to have a number of instances of Splunk running on the same host, and it doesn’t give you any information about the host. CoreOS leverages SystemD which has an improved logging facility called JournalD. 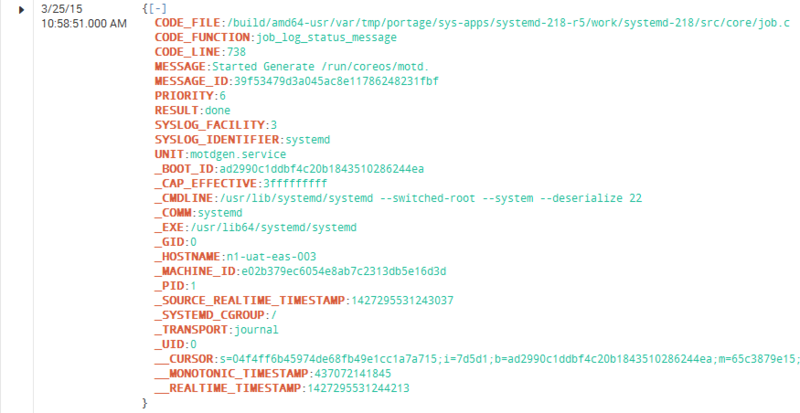 All system events (updates, etcd, fleet, etc) from CoreOS are written to JournalD. Apps running inside docker containers generally log to stdout, and all those events are sent to JournalD as well. This improved logging facility means getting JournalD into Splunk is the obvious solution. The first step was to get the Splunk Universal Forwarder into a docker container. There were already some around, but I wanted to take a different approach. The idea is instead of trying to manage .conf files and getting them into the container, I leverage the Deployment Server feature already built into Splunk. The result is a public image called tnwinc/splunkforwarder. It takes two parameters passed in as environment variables: DEPLOYMENTSERVER and CLIENTNAME. These two parameters are fed into $SPLUNK_HOME/etc/system/local/deploymentclient.conf when the container is started. This is the bare minimum to get the container up and talking to the deployment server. -h %H Sets the hostname inside the container to match the hostname of the CoreOS host. %H gets expanded to the CoreOS hostname when the .service file is processed. -e CLIENTNAME =%H This is the friendly client name. -v /var/splunk:/opt/splunk This exposes the real directory /var/splunk as /opt/splunk inside the container. This directory persists on disk when the container is restarted. This command dumps everything in the journal out to JSON format (more on that later), then tails the journal. The process doesn’t exit, and continues to write out to /var/splunk/journald, which exists as /opt/splunk/journald inside the container. Since I’m not appending, every time the service starts, the file is replaced. You may want to consider a timer to restart the service on a regular interval, based on usage. This was my first experience with Deployment Server, it’s pretty slick. The clients picked up and reached out to the deployment server. My app lives in $SPLUNK_HOME\etc\deployment-apps\journald\local. I’m not going to re-hash the process of setting up a deployment server, there is great documentation at Splunk.com on how to do it. TIME_PREFIX = \"__REALTIME_TIMESTAMP\" : \"
KV_MODE=json Magically parse JSON data. Thanks, Splunk! MAX_TIMESTAMP_LOOKAHEAD JournalD uses GNU time which is in microseconds (16 characters). This setting tells splunk to use the first 10. Once that app was published to all the agents, I could query the data out of Splunk. It looks great! This is where the JSON output format from journald really shines. I get PID, UID, the command line, executable, message, and more. For me, coming from a Windows background, this is the kind of logging we’ve had for 20 years, now finally in Linux, and easily analyzed with Splunk. The journal provides a standard transport, so I don’t have to think about application logging on Linux ever again. The contract with the developers is: You get it into the journal, I’ll get it into Splunk.